Are you looking for a new way to stand out in the crowd? Try one of the many flavors of Drink Rimmer from Stirrings. Blended to complement a drink's flavor, the rimmers are packed in circular tins and designed for your favorite drinks and a Holiday Blend designed for Egg Nog or Mulled Cider. These sophisticated drink rimmers are the most exciting embellishment to a cocktail since the olive met the martini. Add fashionable and devinely delicious flair to the rim of your favorite Margarita or Bloody Mary. Terrific around "virgin" beverages too! 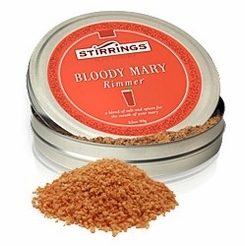 Stirrings Bloody Mary Drink Rimmer 3.5 oz. 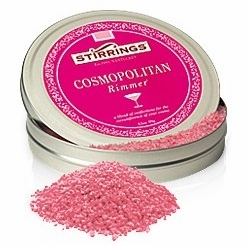 Stirrings Cosmopolitan Drink Rimmer Cocktail Garnish 3.5 oz. 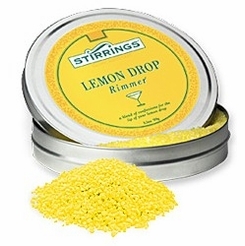 Stirrings Lemon Drop Drink Rimmer 3.5 oz. 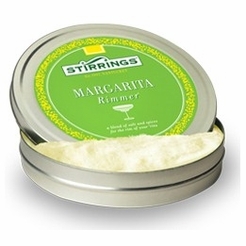 Stirrings Margarita Drink Rimmer Cocktail Garnish 3.5 oz. 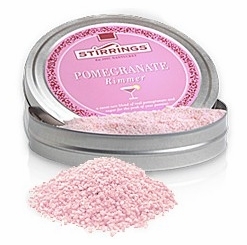 Stirrings Pomegranate Rimmer Cocktail Garnish 3.5 oz.